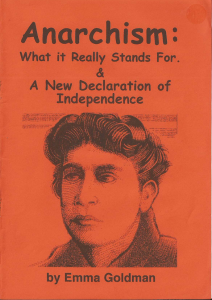 Emma Goldman (1869-1940) was a Jewish immigrant and political radical who became one of the major Anarchist political figures in Europe and North America in the decades before the Second World War. A public intellectual, author, lecturer, and activist, Goldman helped to transform the face of Anarchism and the political left, developing a political and social philosophy that would come to be known as Anarcha-Feminism. Goldman’s brand of feminism was distinct from the other “First Wave” feminists and Suffragettes of her era. Rather than seek entrance into the industries and domains held by men or seek to assimilate into the existing political, economic, and social spheres, Goldman sought to contest and deconstruct patriarchy, capitalism, nationalism, and other superstructures that engineer and maintain oppression of all marginalized people. One of the reasons Goldman is still an object of historical fascination for leftists, feminists, artists, and academics is because she was decades before her time. In addition to lecturing against the first two World Wars, capitalism, and the state, she advocated for polyamory, reproductive justice, and free, open love. She was an early and fierce advocate for demographics that we would now classify as LGBT, decades before the Sexual Revolution of the 1960s. She held public lectures on birth control, and was imprisoned for two weeks for educating people about contraception and family planning. Additionally, she was an early critic of the prison system, military and empire, and religion. 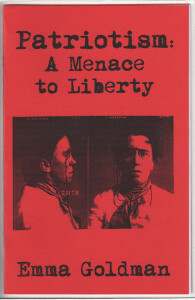 Goldman was known in her era, ironically, as “The Queen of Anarchism,” due to her transnational notoriety and critical feminist contribution to anarchist and leftist theory and politics. On her tombstone is the quote “Liberty will not descend to a people, a people must raise themselves to liberty.” This quote encapsulates her understanding of liberation, and the drive behind her gendered anarchist praxis. To this day, devoted disciples and admirers continue to leave mementos and graffiti well-wishes on the back of her tombstone.